Blade length :　56.8　cm or 22.36 inches. Width at the hamachi : 2.65 cm or 1.043 inches. 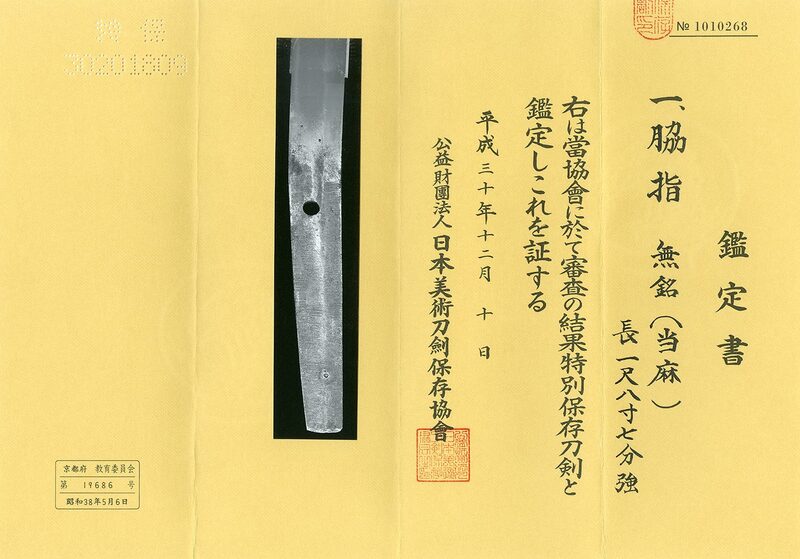 Width at the Kissaki : 1.71 cm or 0.67 inches. Kasane : 0.60 cm or inches. Shape : Osuriage Mumei, regular width and thickness Wakizashi. Jigane : Mixture of Itame Hada and O Mokume Hada. There are some Masame Hada. Hamon : Ko Nie Deki, Suguha with thick Nioikuchi. The Hamon is bright and soft Habuchi. Taima school, Senjuin school, Hosho school in Yamato province. Taima was the swordsmith group at around Taima temple. The earliest ancestor of Taima is Kuniyuki. And Aritoshi and Arikiyo and Ariyuki are famous in Taima swordsmiths. and Nie based Suguha and little Midare.